But the bill met a predictably harsh reception from some Republicans. They argued the spending plan would lead to budget deficits. To invest in services, while preserving a savings account, the budget would stretch out payments intended to fill a deficit in the state pension plan. It also continues transfers from the highway fund, although it would take less money from roads than in recent years. That would let Kansas plow money into schools, child welfare and an expanded Medicaid program that would offer health coverage to an added 150,000 or so Kansans. Kelly’s budget also shoots to end a years-long school funding lawsuit. It would add $92 million a year more for schools to comply with a court decision from last year. The budget follows a theme Kelly has repeated, that she inherited problems from her Republican predecessors and that she can’t restore state services in a single year. Kelly’s budget director, Larry Campbell, told lawmakers in a budget briefing that the spending plan invests in services while allowing Kansas to weather economic uncertainty that, he said, could include a possible recession in the coming months or years. “We need a cushion, and we need tools back in the toolbox to address the unforeseen economic challenges coming,” Campbell said. Larry Campbell, the budget director for Democratic Gov. Laura Kelly, laid out the administration's spending plan to lawmakers on Thursday. At the end of fiscal year 2020, Kelly’s budget would leave Kansas with a $686 million reserve. That’s 9 percent of state spending and a decrease from the $761 million the state had banked at the end of fiscal year 2018. 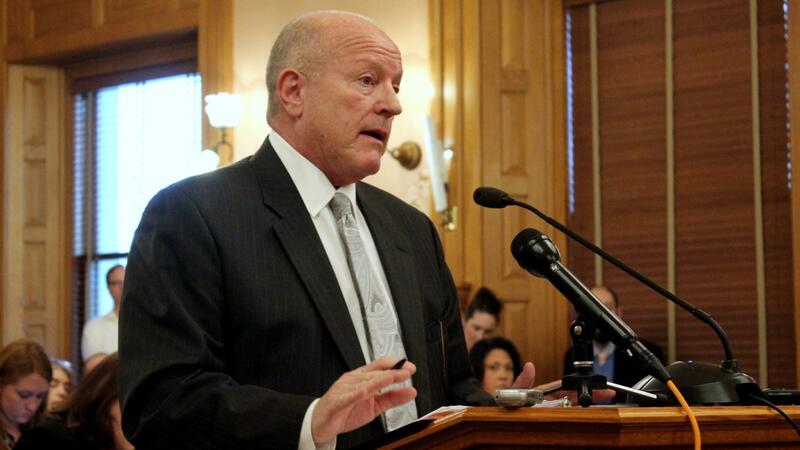 Republican Senate Majority Leader Jim Denning said lawmakers don’t want to extend the payoff schedule in the Kansas Public Employees Retirement System, or KPERS. Without the restructured pension payments, he said, the numbers in the budget don’t work. “This whole budget is built on a house of cards,” Denning said after the meeting. Kelly’s also pushing to expand the health care program Medicaid. She’s budgeted $14 million, although the administration says the cost would rise in the following year. That is an underestimate of the true cost, Denning said. “We know that it’s impossible,” Denning said. Yet Denning applauded the proposal to reduce transfers from the highway fund. Medicaid expansion will likely have bipartisan support in the Legislature. A bill passed both chambers in 2017 but was vetoed by then-Gov. Sam Brownback. Democratic Rep. Kathy Wolfe Moore said even if the cost estimate isn’t exact, Medicaid expansion is something lawmakers need to do because of the benefit it could offer to Kansans and struggling rural hospitals. “I absolutely believe we have to invest in that,” Wolfe Moore said. The spending plan also makes investments in a variety of other services. It would spend $22 million to give state employees a 2.5 percent raise. The plan would reverse a funding cut universities absorbed in 2016. Those cuts had already been partially restored and finishing the job will cost almost $9 million. To tackle problems in the state’s troubled child welfare system, the budget proposes hiring 55 more social workers at a cost of $4 million. The plan would also spend more than $7 million on services aimed at keeping children in their homes so they never enter the foster care system in the first place. The governor’s spending plan serves as a template for state lawmakers. Now, budget writers from the House and Senate will begin digging deeper into the bill and developing their own spending priorities. Stephen Koranda is Statehouse reporter for the Kansas News Service Kansas, a collaboration of KCUR, Kansas Public Radio, KMUW and High Plains Public Radio covering health, education and politics. Follow him on Twitter @kprkoranda. The new governor — Democrat Laura Kelly — proposes a budget that pays for her priorities. It highlights things that she believes her election shows that voters also want. Republican legislative leaders respond with what amounts to, Thanks, but we’ve got a better handle on what Kansans want. Kansas swore a new governor into office on Monday and saw the end of eight years of Republicans in the office. New Democratic Gov. Laura Kelly told supporters, and the Republican lawmakers she’s sure to clash with, that the state had lost its sense of community. That seemingly was a dig at predecessors Sam Brownback and Jeff Colyer. Think of Laura Kelly as the fix-it governor. As in she needs to fix what, by most accounts, is a state government in desperate need of repair. For the first year or two of her administration, her biggest job will be restoring the capacity of state agencies crippled by budget cuts and the exodus of employees with the skills and institutional knowledge needed to keep the trains running on time. Or, more to the point, balance the state budget, adequately fund schools and ensure that foster kids are placed in safe and stable homes.